I’ve helped so many homeowners makeover their exteriors that I’ve lost count but that doesn’t mean I have lost my enjoyment of looking at before and after pictures. 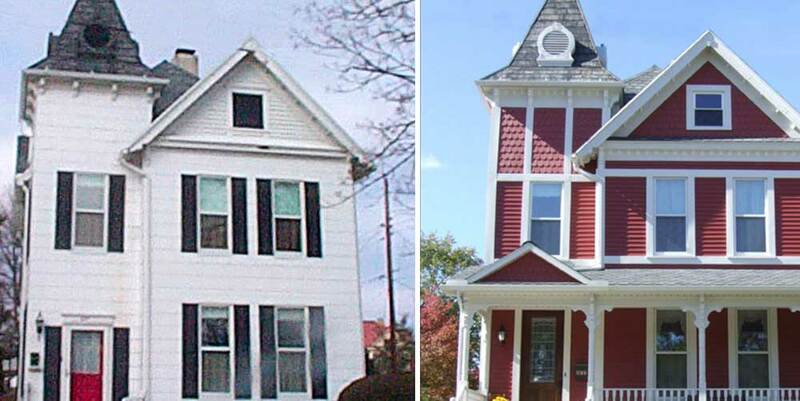 When I see images like the ones below I can’t help but decipher exactly what the homeowners changed to improve the curb appeal of their exterior. 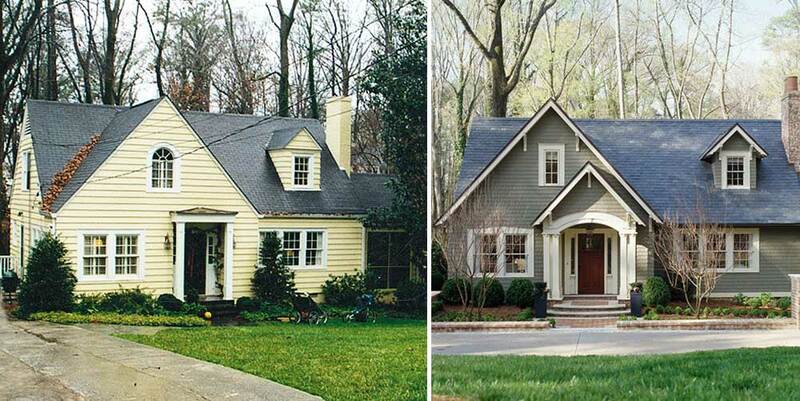 Here are a couple of my favorites from an article on Better Homes & Gardens (bhg.com) showing many before and after photos. One of the main factors in creating curb appeal is to draw attention to the entrance and to make it feel welcoming. 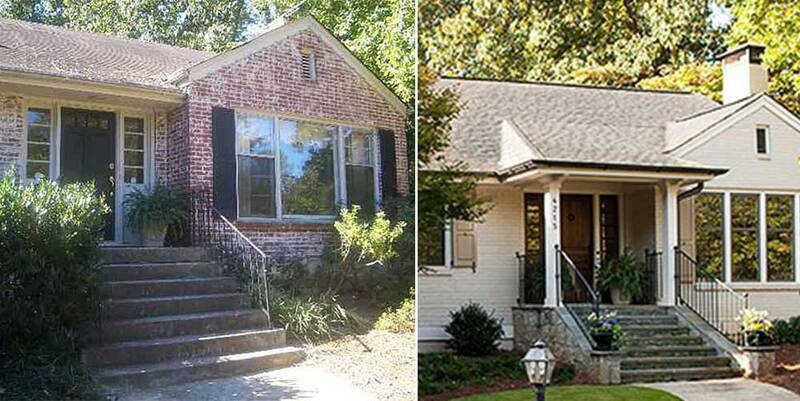 These homeowners did that by adding architectural details, new landscaping and updated colors. Those changes have made this nondescript house into a charming home. Even without all of the changes to the details and doorway this home would have been much improved by updating the siding and trim color. I often see homes like this painted all white or black and white. This scheme does little to show off the details that make this style special. Removing the shutters, painting the siding a rich red enhanced by the high contrast white trim plays up the details beautifully. Just changing the color would go a long way in improving the look of this home. Adding more trim and a front porch maximizes its appeal. I don’t often advocate painting brick but when it looks like a dated hodgepodge as in this home painting it is the best solution. Khaki on the siding and shutters unifies the home exterior and both blend with the roof color. Adding stone with the same colorcast to the steps and adding to the roof enhance the entranceway. Admit it. You enjoy looking at before and after images as much as I do, right? Would you like me to see before and after pictures of your home? Here is your opportunity. All you have to do for a chance to win a home exterior makeover including a rendering of the “after” to your “before” picture is enter the 2015 “Shake it Up” Exterior Color Contest. Just submit your home’s “before” picture. Then, tell us (in 250 words or less) how you’d like to “shake up” your home exterior with color and colorful products. Today’s Homeowner with Danny Lipford radio show co-host Allen Lyle and I will look at the pictures and text submitted to the contest to determine three finalists. I will then work with a professional artist to create a renderings of each “after” images along with a product wish lists of how the three finalists can transform their home’s exteriors by adding color and colorful products manufactured by the contest sponsor and partners. Wouldn’t you like to see your home in one of the “after” images? If so go now and enter… you only have until April 24 to enter for your chance at $2,500 cash to add color to your home!